David B. Drake, PhD is the Executive Director of the Center for Narrative coaching in California (www.narrativecoaching.com). The Center works with organizations to improve their coaching capabilities and to develop an integrated strategy so that coaching becomes the way business gets done. David teaches advanced narrative/coaching skills around the world, and he works with several universities on coaching development and narrative research. he is a co-founder of the Coaching Commons (www.coachingcommons.org). David has written over twenty articles, papers and chapters on narratives, evidence, and coaching. Diane Brennan is an executive coach and consultant working with individuals and organizations in the fields of health care, academics and business. She holds a Master's in Business Administration and is credentialed by the International coach Federation (ICF) as a Master Certified Coach. Prior to coaching, Diane spent over 20 years in executive and clinical practice positions within private and publicly traded health care organizations in the United States. Kim Gørtz holds a master degree in philosophy and psychology from the University of Copenhagen. He has taught at the Copenhagen Business School for seven years as well as Roskilde University and the University of Southern Denmark. For the past three years Kim has been conducting an industrial PhD research project for the Nordea bank, with a focus on coaching, leadership development and engagement. he has published several books on philosophy in business life, philosophy and coaching, and value-based leadership. Introduction (Diane Brennan, Kim Gørtz and David B. Drake). PART I: FOUNDATIONS FOR COACHING. Chapter 1 The Life Coach Operating System: Its Foundations in Psychology (Patrick Williams). Chapter 2 Coach Self-Management: The Foundation of Coaching Effectiveness (Travis Kemp). Chapter 3 Thrice Upon a Time: Narrative Structure and Psychology as a Platform for Coaching (David B. Drake). Chapter 4 Does it Matter What the Coach Thinks? – A New Foundation for Professional Development (Peter Jackson). Chapter 5 Connecting the Dots: Coaching Research – Past, Present and Future (Francine Campone) Reflections on Foundations for Coaching (David B. Drake). PART II: APPLICATIONS OF COACHING. Chapter 6 An Appreciative Inquiry Coaching Approach to Developing Mental Toughness (Sandy Gordon). Chapter 7 Focus on Cultural Elements in Coaching: Experiences from China and Other Countries (Charles Hamrick). Chapter 8 Coaching and Workplace Stress (Kristina Gyllensten). Chapter 9 Coaching for Wisdom: Enabling Wise Decisions (Peter Webb). Chapter 10 Coaching the Human Spirit (Peter J. Reding and Marcia Collins). Chapter 11 Achieving Tangible Results: The Development of a Coaching Model (Sabine Dembkowski and Fiona Eldridge). 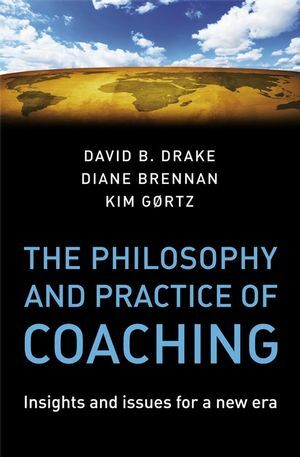 Reflections on Applications of Coaching (David B. Drake). PART III: ORGANIZATIONS AND COACHING. Chapter 12 Coaching the Team (David Clutterbuck). Chapter 13 Leadership Coaching: The Impact on the Organization (Diane Brennan). Chapter 14 Creating Corporate Coaching Cultures for Resiliency and Performance (Vicki Escudé). Chapter 15 Coaching and Leadership in the Six Cultures of Contemporary Organizations (William Bergquist and Vikki G. Brock). Chapter 16 Coaching, Lean Processes, and the Concept of Flow (Kim Gørtz). Chapter 17 Taking Coaching to the Next Level: Critical Insights from ROI Evaluations (Merrill C. Anderson). Reflections on Organizations and Coaching (David B. Drake).